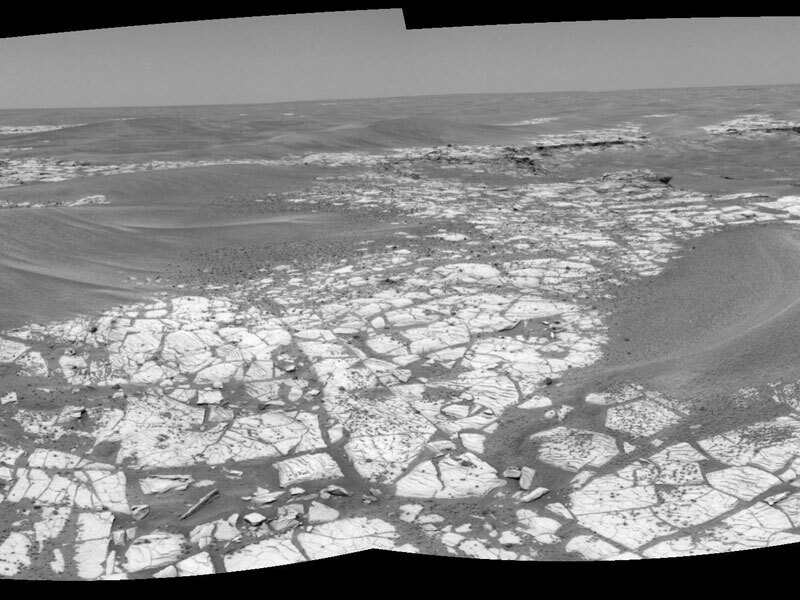 Posted by jtintle in JPL, Mars, Mars Global Surveyor, NASA, Planets, Space Agencies, Space Fotos, Spacecraft. This is a "3-D" stereo anaglyph showing layers in Galle Crater. It is a view of a portion of the same location featured in a mosaic yesterday, 15 June 2006, entitled "Galle Bedding." To see the layers in three dimensions, one must use "3-D" glasses with a red left eye and a blue right eye. This anaglyph uses two Mars Global Surveyor (MGS) Mars Orbiter Camera (MOC) images acquired at slightly different viewing angles: MOC images E22-01557 and M14-02055. Owing to the specifics of the viewing geometry, the image is tilted on its side, relative to the mosaic shown in the 15 June 2006 release. In other words, in this image, north is toward the right and west is up. This anaglyph, when viewed in conjunction with the 15 June 2006 mosaic of these layers, provides a more complete sense of the cross-cutting relations between layers in the mound located in southern "Galle (Happy Face) Crater." The layers are part of a mound of sedimentary rock in southern Galle — a remnant of a once more-extensive deposit of sedimentary material in this south mid-latitude impact basin. Posted by jtintle in JPL, Mars, Mars Global Surveyor, NASA, Planets, Space Agencies, Space Fotos, Space Science Institute, Spacecraft. This picture is a composite of Mars Global Surveyor (MGS) Mars Orbiter Camera (MOC) daily global images acquired at Ls 66° during a previous Mars year. This month, Mars looks similar, as Ls 66° occurs in mid-June 2006. The picture shows the Acidalia/Mare Erythraeum face of Mars. Over the course of the month, additional faces of Mars as it appears at this time of year are being posted for MOC Picture of the Day. Ls, solar longitude, is a measure of the time of year on Mars. Mars travels 360° around the Sun in 1 Mars year. The year begins at Ls 0°, the start of northern spring and southern autumn. 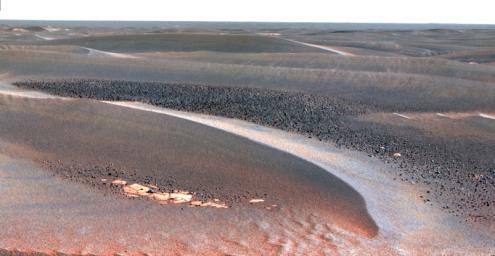 Posted by jtintle in APoD, Cornell, JPL, Mars, Mars Rovers, NASA, Planets, Space Agencies, Space Fotos, Spacecraft, Website. Posted by jtintle in European Space Agency, Mars, Mars Express, Planets, Space Agencies, Space Fotos. 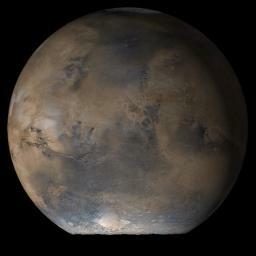 Posted by jtintle in JPL, Mars, Mars Global Surveyor, NASA, Planets, Space Agencies, Space Fotos. This picture is a composite of Mars Global Surveyor (MGS) Mars Orbiter Camera (MOC) daily global images acquired at Ls 53° during a previous Mars year. This month, Mars looks similar, as Ls 53° occurred in mid-May 2006. 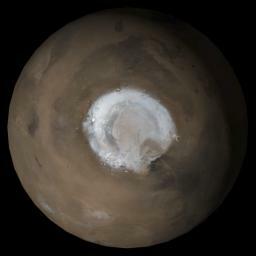 The picture shows the north polar region of Mars. Over the course of the month, additional faces of Mars as it appears at this time of year are being posted for MOC Picture of the Day. Ls, solar longitude, is a measure of the time of year on Mars. Mars travels 360° around the Sun in 1 Mars year. The year begins at Ls 0°, the start of northern spring and southern autumn. Posted by jtintle in European Space Agency, Mars, Mars Express, Planets, Space Fotos. 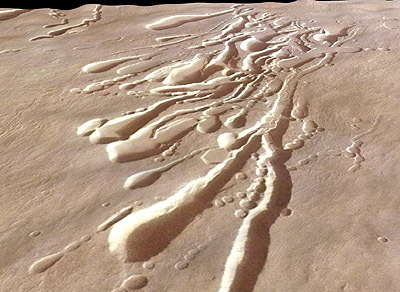 This perspective view, taken by the High Resolution Stereo Camera (HRSC) on board ESA's Mars Express, shows Pavonis Mons, the central volcano of the three 'shield' volcanoes that comprise Tharsis Montes. 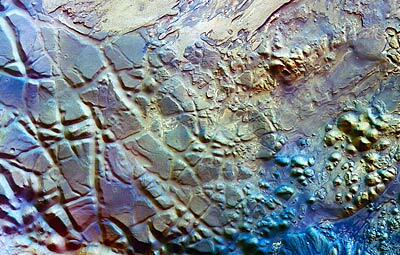 ESA's Mars Express spacecraft obtained this image using the HRSC during orbit 902 on 2 October 2004 with a ground resolution of approximately 14.3 metres per pixel. Posted by jtintle in Mars, Mars Rovers, NASA, Planets, Space Fotos. As NASA's Mars Exploration Rover Opportunity continues to traverse from "Erebus Crater" toward "Victoria Crater," the rover navigates along exposures of bedrock between large, wind-blown ripples. Along the way, scientists have been studying fields of cobbles that sometimes appear on trough floors between ripples. They have also been studying the banding patterns seen in large ripples.This view, obtained by Opportunity's panoramic camera on the rover's 802nd Martian day (sol) of exploration (April 27, 2006), is a mosaic spanning about 30 degrees. It shows a field of cobbles nestled among wind-driven ripples that are about 20 centimeters (8 inches) high.The origin of cobble fields like this one is unknown. The cobbles may be a lag of coarser material left behind from one or more soil deposits whose finer particles have blown away. 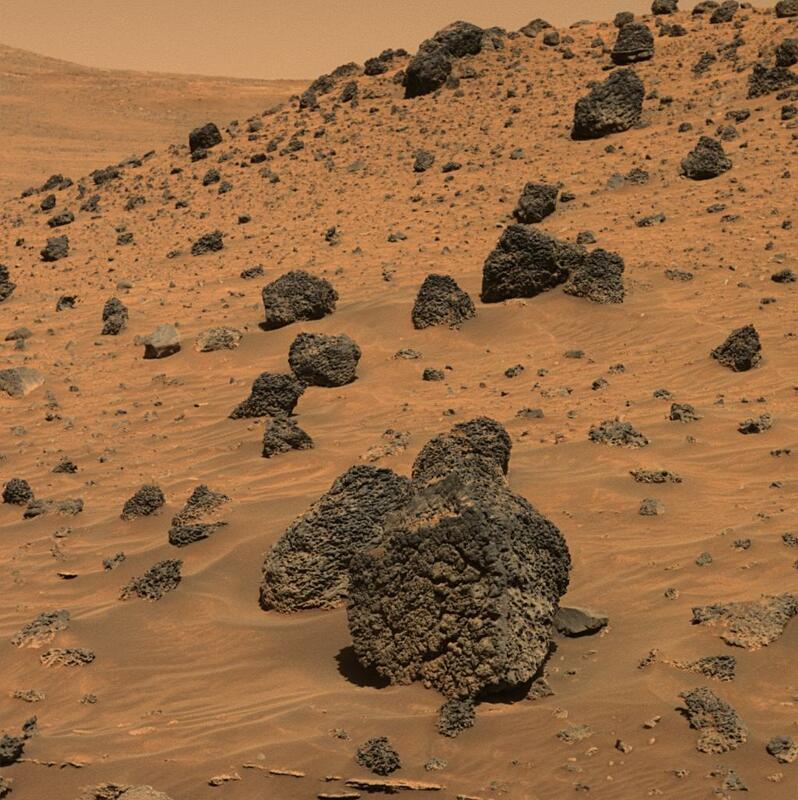 The cobbles may be eroded fragments of meteoritic material, secondary ejecta of Mars rock thrown here from craters elsewhere on the surface, weathering remnants of locally-derived bedrock, or a mixture of these. Scientists will use the panoramic camera's multiple filters to study the rock types, variability and origins of the cobbles.This is a false-color rendering that combines separate images taken through the panoramic camera's 753-nanometer, 535-nanometer and 432-nanometer filters. The false color is used to enhance differences between types of materials in the rocks and soil. Posted by jtintle in Illustration, Mars, Planets, Space Fotos, TPOD. Astronomers seek to calculate earlier atmospheric conditions on Mars based on the present rate of atmospheric loss. But such attempts are inevitably flawed. The wild card is the role of planetary catastrophe in the past. Mars has an atmosphere only one hundredth as dense as the Earth's. Before space probes visited it, astronomers expected it to be ten or more times thicker than it is. ESA's Mars Express orbiter has come up with a possible explanation (see illustration above). The orbiter has been measuring how much atmosphere is being removed from Mars today by solar wind interactions. The total is about 1 kilogram (2.2 pounds) per second, or about 100 tons per day. That's not fast enough to have depleted Mars' atmosphere in the accepted length of Martian history, but presumably when there was more atmosphere, the process happened faster. But the concept breaks down when you consider Venus. By standard theory, Venus, Earth and Mars have a common origin in the solar nebula. They must have received similar original amounts of air and water. Earth has held on to most of its air and water because it has a magnetic field to protect it from the solar wind. Neither Venus nor Mars have magnetic fields today (although Mars is thought to have had one early in its history). 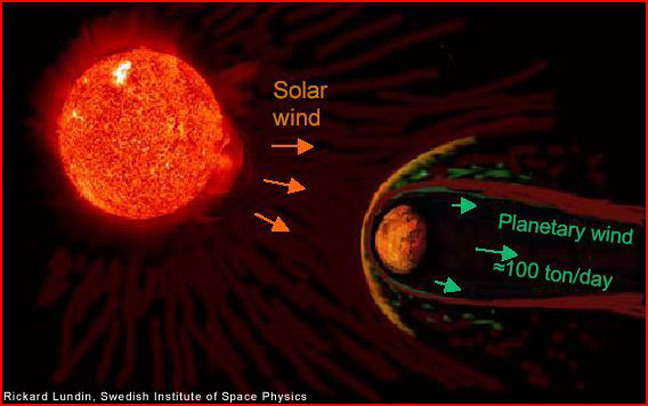 If Venus has been bombarded by solar wind for as long as Earth and Mars, then its atmosphere should have been depleted, too. But it isn't. Instead, Venus' atmosphere is 90 denser than Earth's atmosphere. For the Electric Universe, there is no reason to think of Venus, Earth and Mars as siblings. Nor is it reasonable to think of them as moving along the same orbits for billions of years. Each planet had a separate birth, and even if some or all were born in the same set of plasma instabilities, their characteristics would be dependent on the composition and discharge history of the particular plasma cell in which they were individually formed. After the birth event, the planets also have a history. Each of them took part in several catastrophic events, the most recent of which is commemorated by prehistoric humans in rock art and in myth. It isn't necessary to suppose that Mars has been losing 100 tons of air a day for billions of years because a few thousands of years ago Mars went through a major event that could have stripped it of its atmosphere and oceans all at once. Plasma interactions were undoubtedly involved; history remembers them as the magical thunder weapon of the warrior hero. But these plasma interactions were much more active than those described above by the Mars Express researchers. Electric discharge will sometimes take away material (as in the 100 tons per day from the Martian atmosphere). But it can also deposit new material in sorted layers. Or even a whole new atmosphere. As space probes have returned data about density of atmospheres among our solar neighbors, astronomers have been surprised in many cases. Too much air on Venus and Titan; too little on Mars. Earth is considered the "just right" example of how much air a planet should retain for its mass. But electrically speaking, there is no standard initial atmosphere and subsequent changes are not necessarily slow or steady. No wonder the planetary atmospheres don't appear to comply with the astronomical texts. Posted by jtintle in Cornell, JPL, Mars, Mars Rovers, NASA, Planets, Space Fotos. Explanation: What created this unusually textured rock on Mars? Most probably: a volcano. Dubbed Bumpy Boulder, the strange stone measuring just under a half-meter high was found by the robotic Spirit rover currently rolling across Mars. 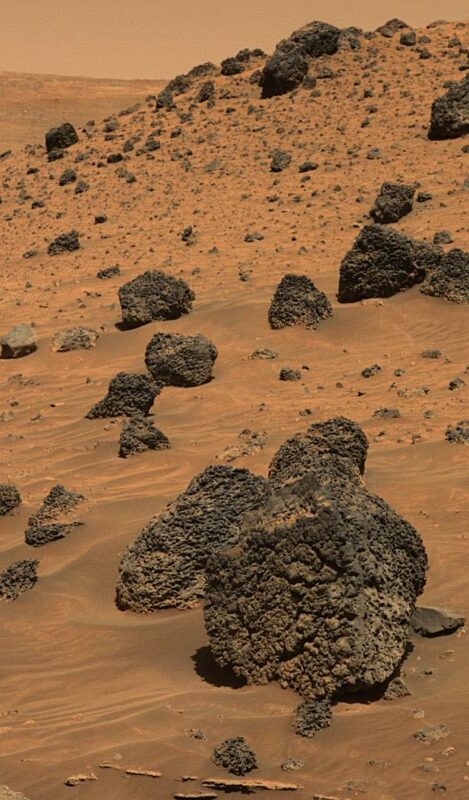 Pits on the raged rock are likely vesicles and arise from hot gas bubbling out of hot rock ejected by an active Martian volcano. Several similar rocks are visible near Bumpy Boulder that likely have a similar past. The above true-color image was taken about one month ago. The Spirit rover, now in its third year of operation on Mars, is weathering the low sunlight winter of Mar's northern hemisphere on a hillside slope in order to maximize the amount of absorbable battery-refreshing sunlight. Posted by jtintle in JPL, Mars, Mars Rovers, NASA, Planets, Space Fotos, Vidcast.